Most people agree that we cannot answer the question, is there a God? with a clear proof, either way. So most arguments for or against the existence of God start with observable features of our world, and try to show that these are compatible with the belief we ourselves hold, but incompatible with the opposite belief. I’ve had some recent discussions that suggest to me that our human experience of free will is a strong argument against atheism. Atheists don’t believe in God, and most of them don’t believe in anything supernatural. In other words, almost all atheists are naturalists. And most naturalists believe the natural world is composed only of the physical or material things we are familiar with – matter and energy. So in this post I’m going to take it that most atheists are materialists (or physicalists), although I know there are a few that are not. It seems that most atheists therefore don’t believe we have free will. Famous biologist Francis Crick said that humans, including our supposedly free will, “are in fact no more than the behaviour of a vast assembly of nerve cells and their associated molecules”. Other atheists like philosopher Daniel Dennett and neuroscientist Sam Harris support this conclusion. And with good reason. If the world is only physical, then only physical events can cause other physical events. And physical events are governed, or described, by laws that are generally well understood. If a scientist knows enough about a particular situation, she can in principle predict the next stage using known laws. So the electrical and chemical processes in our brains are also described and controlled by physical laws. And those processes, if materialism is true, are all there is to you and to me, as Francis Crick said. There is no mind, no “us”, apart from the processes. So there is no way “I” can interrupt those processes, because I am those processes. If the physical is all there is, our brain processes, and therefore our thinking, are physical. That is, causes produce effects according to known physical laws. A neuron passes information across a synapse to another neuron, which responds in a way determined by the laws of physics. This cause-effect processing is the basis of all our thinking. And our thinking is determined by these processes. On the other hand, logic is based on ground-consequence relationships. Our beliefs are made up of every opinion we hold, and if a belief is rational, it is a consequence of the assumptions or premises we start with; and the premises are the grounds of the conclusions. For example, I hear that a politician has a certain policy (ground) so I form the belief I will vote for him (consequence). An atheist might see the suffering in the world (ground) and so form the belief that no God exists (consequence). So to think logically, we have to be able to “see” that a consequence logically follows from the grounds we began with, and then be free to choose our beliefs accordingly. This straightaway raises a problem for the atheist, for if materialism is true, our brains work by determined cause-effect processes while logic requires ground-consequence processes and choice. The two are different. So at first glance, it might appear that our brains cannot do logic at all if determinism and atheism are true. How can cause-effect brains do ground-consequence logic? A computer is programmed so that its physically determined electrical processes can produce logical outcomes. So, it is argued, natural selection can lead to physically-determined brain processes producing logical outcomes just like a computer can do. Of course the human brain is more complex than a computer, a computer doesn’t, as far as we know, have any beliefs, and (for the atheist at least) the brain isn’t designed by a designer, but the analogy offers some hope of resolving the dilemma. We need to be clear what is being claimed here. Brain state S1 leads by physical laws at work in the brain to state S2. 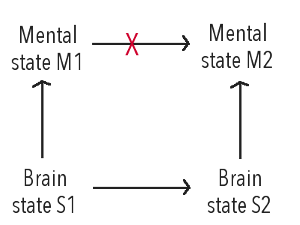 Each state has an associated mental state, M1 and M2, but M1 does not produce M2, because M2 is produced via the physical cause and effect processes between S1 and S2. But, it is claimed, if natural selection has done its work, the brain has evolved so that M1 logically implies M2 even though M2 isn’t the result of logic. Thus, like a computer, the brain has come to a logical conclusion even though it hasn’t used logic, just physical laws. Can natural selection do this? A computer can use cause-effect electrical processes to produce logical outcomes because the hardware and software were designed to achieve this. But an atheist doesn’t believe that human brain processes were designed with an end in mind, it was all natural selection. Now we know that natural selection favours capabilities that increase the likelihood of reproducing. Zebras that run fast live longer than slow zebras, and so reproduce more zebras with genes that enable fast running. And so the whole zebra population becomes faster. So for natural selection to produce a brain where cause-effect processes are capable of producing logical outcomes, that result has to lead to a greater probability of reproducing. We can see that some cognitive faculties are helpful for surviving to reproduce. A zebra that reacts more quickly when a lion appears, or a suspicious sound is heard in long grass, will be more likely to survive to reproduce than one which reacts slowly. But it doesn’t really matter whether the zebra believes that a lion is there. What matters for natural selection is that the zebra reacts quickly and lives to breed and pass on its genes. So it doesn’t require that the zebra reasons logically that a lion is there – stopping to reason would likely make the zebra less likely to survive. 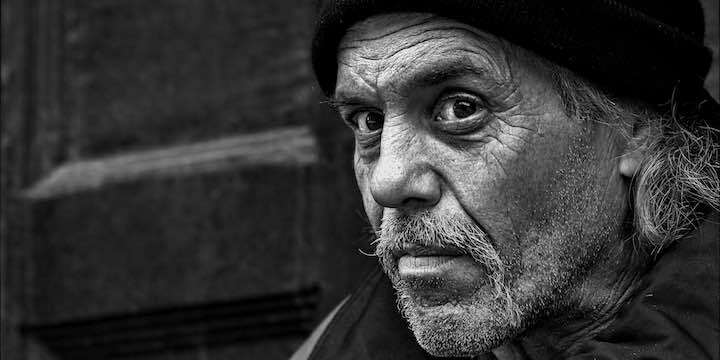 The best survival strategy will likely be to react on suspicion rather than take the risk of waiting until being sure. So the best survival strategy will probably react more often when the belief is false than when it is true. So we can see that many of our most important survival mechanisms don’t require any reasoning and don’t produce any beliefs – for example, all our unconscious bodily processes related to breathing, regulating our bodily temperature, etc. And others work just fine with false beliefs. So natural selection works on our reactions and actions, and, if materialism is true, our reasoning processes and beliefs are simply by-products of natural selection. But don’t beliefs affect behaviour? If materialism is true, beliefs are the result of brain states, not their causes. Thus beliefs may appear not to directly influence behaviour, and many philosophers argue this. However, our brains receive inputs from the external world and respond to them, so it seems likely that beliefs can likewise have an impact on brain processes, by being part of the data which our brains use to make decisions. But it is important to note that there is no choice in this, if materialism is true. The brain deals with these beliefs in a way determined by evolution. The beliefs may be true or not, but the brain will only recognise this if natural selection creates a brain able to discern right and wrong. But is this possible? Does logic assist survival and reproduction? It seems plausible. Being able to reason surely assists in survival and reproduction, doesn’t it? So wouldn’t the ability to reason develop and improve via natural selection? There are many different levels of cognitive faculties. Some bacteria and amoeba are able to respond to their external environment and move to a more favourable location, but they can do little else. The small parrots in my backyard have learned to perch on our doorknob and call, and we will replenish their seed, but I don’t suppose they could add 4 + 4. A child of 9 can do that simple addition but probably cannot recognise Modus Ponens or calculate Bayes Theorem. Once in the long distant past I gained a Distinction in a university statistics exam, but I have no idea how anyone could prove Fermat’s Last Theorem. However just over 20 years ago Andrew Wiles solved the Theorem, the proof taking 129 pages, but I doubt there are many people in the entire world who could understand it. So can natural selection be sufficient to explain Andrew Wiles’ mind, and higher cognition in general? As we have seen, appropriate reactions are certainly necessary for survival. So the lower end of the scale of cognitive faculties can surely be explained by natural selection. And an ability to organise and choose between competing options might well make life more efficient. But as we go higher up the scale, surely the survival and reproduction benefits reduce and the impact of other factors becomes more important. For example, psychologists sometimes classify thinking as either intuitive and analytical. The latter is more likely to employ logic, but isn’t always the most effective mode of thinking. In complex situations, or where a quick decision is required, intuitive thinking is generally more effective. An early homo sapiens who stopped to analyse the situation may not survive so well in Africa! It is a sad but apparently often true fact that many women prefer a handsome, muscled Adonis to a clever logician, and many men are more attracted to a pretty face than to a PhD in economics. Of course, some people are both clever and attractive, but it is often not that way. So clever cognitive faculties may not lead to great reproductive success. Higher cognition puts an additional load on the human system. We have larger energy requirements and a longer time between conception and full independence. These are negatives for natural selection which any advantages of cognition have to overcome. And while a tool-making ape may well eat better and so live and reproduce better than one without that ability, it is hard to see how the ability to program a computer or prove Fermat’s last Theorem are going to help much in passing on genes. So higher levels of cognition seem unlikely to supply any significant competitive advantage, and are likely to be outcompeted by other characteristics like speed and quick reactions (to flee predators), or strength and charisma (to fight off competing males, attract mates and so reproduce more). I have discussed this with atheists and done a little reading, and so far I have seen assertions that higher cognition can arise via natural selection. But I haven’t yet seen anyone explain exactly how it would happen, and some philosophers who argue that it cannot. I know of a post-doc researcher in the science of religion who uses computer models to explore this field. Surely it would then be possible to use a computer model to show how higher cognition could arise? But until then, I think it is reasonable to doubt natural selection can lead to this, and to await some more complete explanation. But suppose that determinism is true and natural selection did indeed produce human brains. There are still, I think, negative implications here for atheism and materialism. The problem arises when people disagree. That means our respective brains have used our determined cause-effect processes to arrive at different conclusions. Sometimes we can resolve these matters – for example, there is some piece of information that one person lacks, and when it is explained, the two former protagonists agree. But sometimes two people can have the same information and yet still disagree – for example, questions of politics, the ethics of abortion or warfare, and the existence of God. Now if we had choice, and if our brains could do ground-consequence reasoning, we could argue the matter out, testing each other’s assumptions, arguments and conclusions. We may not reach agreement, but we may at least expose some weaknesses in each others’ arguments and give each other food for thought. But if materialism is true, then our brains don’t do ground-consequence reasoning, and our ability to do logic depends on how well our brain’s determined cause-effect processes can simulate logic. So if I disagree with you, it will be because my brain’s cause-effect processes don’t simulate ground-consequence reasoning in quite the same way as yours. And because our brain processes are determined, neither of us have any choice about this. We have seen that a computer can be used as an analogy for a brain (if materialism is true) – both work by determined cause-effect processes which have been programmed to simulate ground-consequence logic (the computer is programmed deliberately by a programmer, whereas the brain has, it is said, been programmed by natural selection). So let us imagine two computers programmed by different programmers communicating with each other. It turns out that the two computers are given the same instructions but produce different results because of their different programming. They can try to argue which result is right, but they have different bases for their conclusions – they have been programmed differently – and each sees their conclusion as correct and the other’s as erroneous. The computers are at an impasse. There is nothing they can do to resolve it. They have no ability to choose beyond the programming in their brains (CPUs). The only way it can be resolved is for the programmers to step in and each check the logic of their programs. I am suggesting that, if materialism is true, it is the same for brains. We can argue, and sometimes we will be able to convince the other person. But on more complex matters which require nuanced judgment, if materialism is true, there is no basis on which to show one view is more right than the other, and no ability to change. Our brains were programmed by natural selection, and won’t easily be changed. It isn’t a palatable conclusion, for it seems to render all philosophical argument nugatory. So when I ask the question on this blog, Is there a God?, and an atheist argues with my conclusion, they are assuming something about discussion and logic and truth that may be difficult to justify from their viewpoint. In order to engage in rational decision making we have to presuppose free will. I think most of us know that this can’t be the truth. We really are able to think, evaluate and choose based on the merits of the argument. We get it wrong sometimes, sometimes our biases trip us up, and sometimes we try to address issues at the limit of our cognitive abilities (like I am doing here!). But overall, our conversations can be sensible and worthwhile. So how does an atheist or materialist explain this dilemma? I have experienced three different responses. These ideas seem to me to show that, arguably, materialism, and hence atheism, is not compatible with the world we experience and the way we arrive at conclusions. This is a reason to consider materialism and atheism untrue. There are other reasons for and against belief in God, of course, but this is one argument that should be considered. Some atheists shrug all this off. They don’t see any problem, it doesn’t concern them, and they don’t seem to have any answer. I think this is a response they would criticise if a theist wasn’t interested in answering an atheist argument like the problem of evil. So I feel it isn’t adequate. I have found many atheists have what seem to be inconsistent views about determinism and free will. When the nature of materialism is explained, they accept that our “choices” must be determined. But then they describe how they make choices in ways that suggest genuine freedom to choose (known as libertarian free will). I feel they are showing in their own reactions the dilemma for materialists – their philosophy tells them they can’t have free will, but their experience tells them they do. I think the problem is compounded by compatibilists, who argue that free will can be compatible with determinism, but it is a truncated form of free will that doesn’t allow any real choice between alternatives. It seems to me like a trick to make materialists and determinists feel better by using freewill language but re-defining free will so it isn’t really free. This was apparent to me when I reviewed the discussions at a meeting of eminent naturalists a few years back. Of course thoughtful materialists have considered all these matters. Mostly they argue that natural selection can do the job and has produced brains that can reason well enough, though I haven’t seen any convincing detailed discussion of how this might occur, and how it might work out in discussion among people with different viewpoints on complex questions. My discussion here is very preliminary, and I claim no philosophical expertise. But these are live issues between philosophers like Alvin Plantinga, JP Moreland, Thomas Nagel, David Chalmers and Victor Reppert, on one side, and John Searle, Daniel Dennett, Jerry Fodor and Michael Draper on the other side. I have read writings by all of these, but not comprehensively, and I will be looking to investigate further the ideas I’ve present here. While I think that this argument increases the probability that materialism is not true and hence that God exists, theism isn’t the only alternative to materialism. Thomas Nagel and (I think) David Chalmers, believe that there may be other options. In other words, atheism doesn’t necessarily entail materialism. But for atheists who are materialists, the argument seems to me to be challenging. « Strong evidence of God?